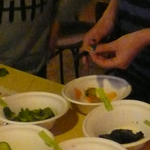 “Edible Slides” is a traveling mini- kitchen, making and projecting healthy edible slides. 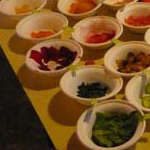 During the workshop visitors will make their own combination of ingredients, depending upon ones taste or aesthetics. 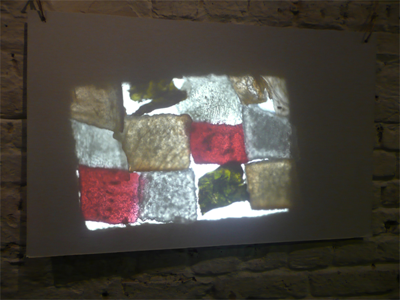 At the end of the workshop we will look at the beautiful snacks through a projector, enlarged and enhanced with light. 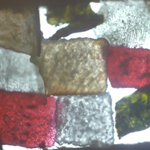 Will you be able to recognize your own slide? And will it be as tasty as it is beautiful? This project aims to allow deeper exploration of the natural foods we eat. It serves as a bridge between the culinary and visual experiences of food, prolonging the moments between food preparation and consumption. It wishes to contemplate on the most daily common ingredients, by exposing and enlarging the beauty of those organisms, which otherwise might be left unnoticed.